Mix beans, salsa and chili powder in 1-quart saucepan. Heat over medium heat about 5 minutes, stirring occasionally, until warm. Spoon about 1/4 cup of bean mixture onto center of each tortilla; spread slightly. Top with lettuce and cheese. Fold over sides and ends of tortillas. Serve with addiditional salsa if desired. 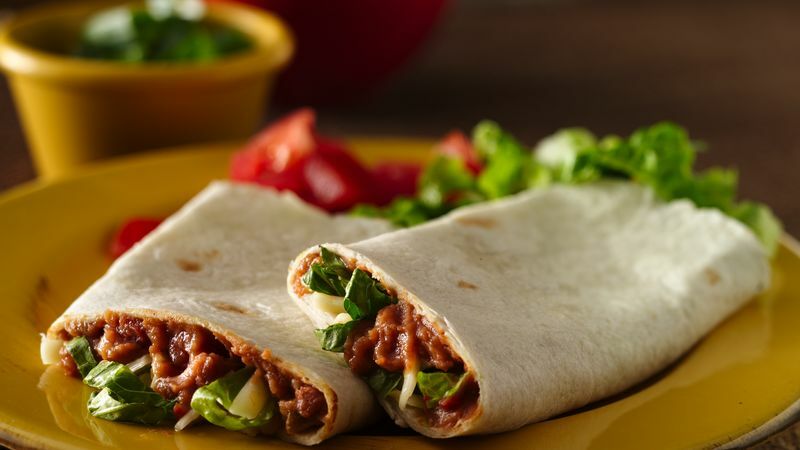 This lighter version of refried bean roll-ups shaves off 70 calories and 7 grams of fat from each serving of the regular recipe. Traditional refried beans are prepared much like their name suggests. Cooked beans are mashed and fried, often in lard. Check your grocery aisle for equally tasty fat-free refried beans. If you like your tacos "loaded," then load these up, too! Bulk them up in colorful, delicious style with chopped or sliced jalapeños, sliced ripe or green olives, chopped tomato or chopped bell pepper.